Simon & Schuster, 9781451651515, 512pp. Acclaimed historian Leslie Berlin’s “deeply researched and dramatic narrative of Silicon Valley’s early years…is a meticulously told…compelling history” (The New York Times) of the men and women who chased innovation, and ended up changing the world. Troublemakers is the gripping tale of seven exceptional men and women, pioneers of Silicon Valley in the 1970s and early 1980s. Together, they worked across generations, industries, and companies to bring technology from Pentagon offices and university laboratories to the rest of us. In doing so, they changed the world. “In this vigorous account…a sturdy, skillfully constructed work” (Kirkus Reviews), historian Leslie Berlin introduces the people and stories behind the birth of the Internet and the microprocessor, as well as Apple, Atari, Genentech, Xerox PARC, ROLM, ASK, and the iconic venture capital firms Sequoia Capital and Kleiner Perkins Caufield & Byers. In the space of only seven years, five major industries—personal computing, video games, biotechnology, modern venture capital, and advanced semiconductor logic—were born. “There is much to learn from Berlin’s account, particularly that Silicon Valley has long provided the backdrop where technology, elite education, institutional capital, and entrepreneurship collide with incredible force” (The Christian Science Monitor). Featured among well-known Silicon Valley innovators are Mike Markkula, the underappreciated chairman of Apple who owned one-third of the company; Bob Taylor, who masterminded the personal computer; software entrepreneur Sandra Kurtzig, the first woman to take a technology company public; Bob Swanson, the cofounder of Genentech; Al Alcorn, the Atari engineer behind the first successful video game; Fawn Alvarez, who rose from the factory line to the executive suite; and Niels Reimers, the Stanford administrator who changed how university innovations reach the public. Together, these troublemakers rewrote the rules and invented the future. Leslie Berlin is Project Historian for the Silicon Valley Archives at Stanford University. She has been a Fellow at the Center for Advanced Studies in the Behavioral Sciences and served on the advisory committee to the Lemelson Center for the Study of Invention and Innovation at the Smithsonian’s National Museum of American History. She received her PhD in History from Stanford and her BA in American Studies from Yale. She has two college-age children and lives in Silicon Valley with her husband, whom she has known since they were both twelve years old. She is the author of Troublemakers. 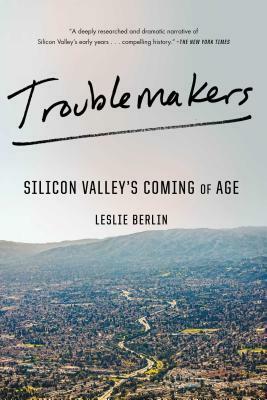 “Leslie Berlin is a master historian of Silicon Valley, and the publication of this book is a landmark event. Kaleidoscopic, ambitious, and brilliant, the book draws on a dazzling cast of characters to chart the rise of the five industries that have come to define technology today and, collectively, to remake the world. "—Eric Schmidt, former CEO of Google and Executive Chairman of Alphabet, Inc.